This floral tapestry "Ornamental Floral" shows a floral bouquet in a garden urn, with a bag pipe. This "Bouquet Cornemuse" tapestry or bagpipe bouquet shows the beauty of nature and music in a piece which shows the lovely arrangement of flowers in full bloom in an ornate white garden urn, on an elaborate pedestal, set in the garden. The bagpipe has been seen in French art since the 16th century, and was thought to have originated in ancient Roman times. The scene is accompanied by a red drape, which represents beauty and luxury. A gorgeously ornate border surrounds the beautiful nature scene. 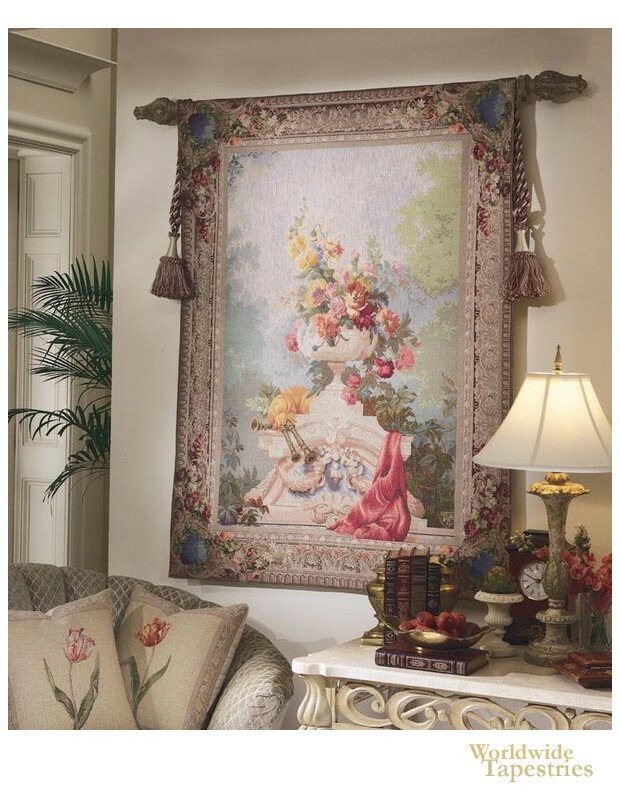 This French tapestry "Ornamental Floral" is backed with a lining and has a tunnel for easy hanging. Note: tapestry rod and tassels, where pictured, are not included in the price. Dimensions: W 41" x H 56"